A US agency says it found no proof that decades of military operations on the Puerto Rican island of Vieques had caused higher levels of illnesses among the population. The report said increased mortality rates could be partially due to a lack of access to medical care. The findings confirm previous studies, which reached similar conclusions. The US Navy used Vieques between 1941 and 2003 to practice firing rockets, missiles and bombs. Puerto Rico is a self-governing territory of the United States. Many of the island's 10,000 residents claimed the drills had caused serious damage to human health and to the environment. But the Agency for Toxic Substances and Disease Registry said there was no credible scientific evidence to link cancers, asthma and other illnesses to the military activities. "That doesn't mean those linkages don't exist. It means we can't find credible scientific evidence to support that," the agency's director, Dr Christopher Portier, said. The study also found that public water supply was safe and that the air was not contaminated. Four US government studies released between 2001 and 2003 had reached similar conclusions. The latest report did, however, acknowledge that those living on Vieques had poorer health than elsewhere in Puerto Rico. It also stated that the cumulative impact of exposures to chemicals remained to be addressed. 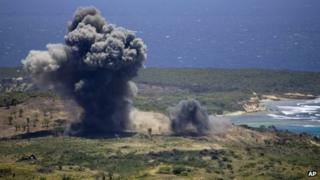 Navy warships and aircrafts used the island to fire live bullets, artillery rounds, rockets, missiles and bombs. In 1999, the forces accidentally fired 263 rounds of ammunition tipped with depleted uranium, violating US law. After years of angry protests, the US eventually shut down its military operations and the naval base was turned into a wildlife refuge. A munitions clean-up is ongoing and is expected to take at least another 20 years.